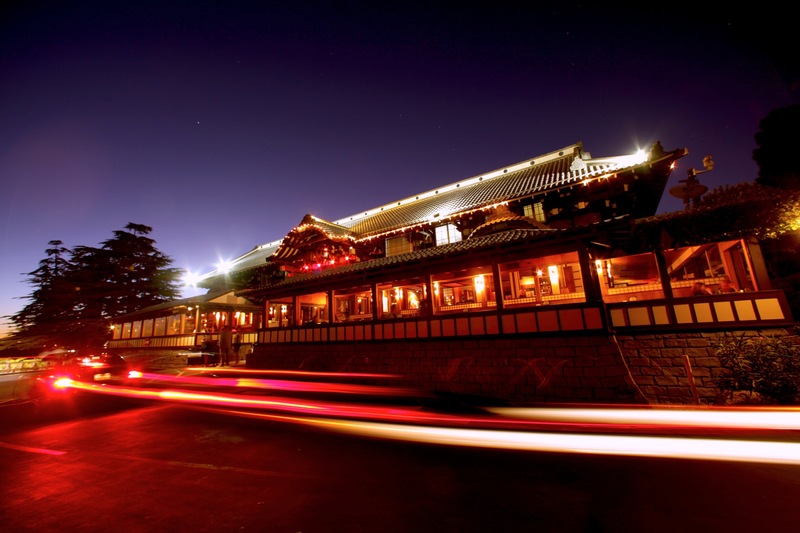 Call us old-fashioned, but we like our haunted places in L.A. authentic. 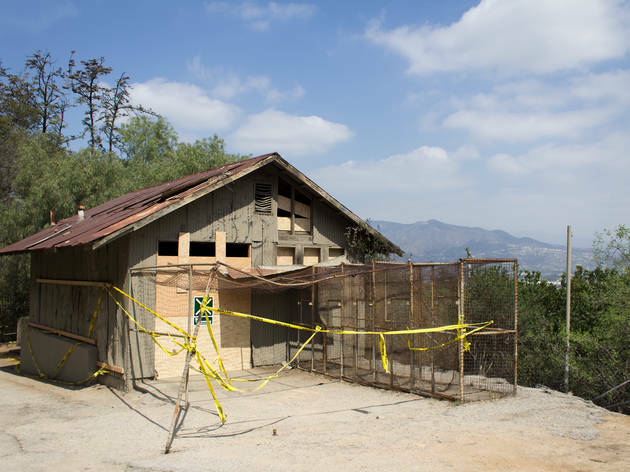 We’re not talking about manufactured scares at haunted houses; we searched the spookiest nabes for horror hot spots—and consulted our friends over at Ghost Hunters of Urban Los Angeles (GHOULA). 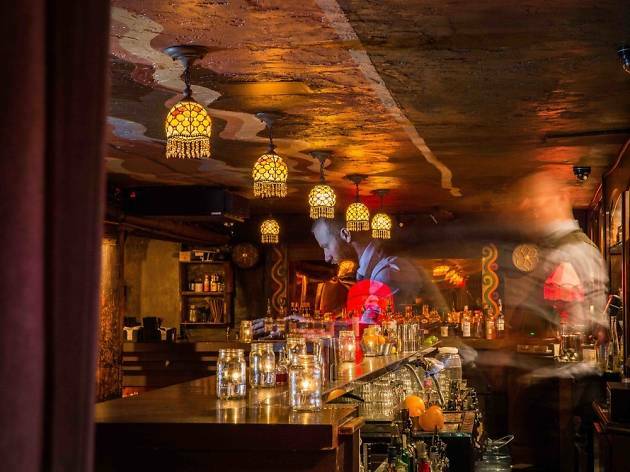 Founder Richard Carradine has been collecting tales of L.A. haunted spots for years, and every month—on the 13th, naturally—GHOULA hosts Spirits with Spirits mixers (currently on hiatus) at some of the city’s spookiest venues, as well as other ghost tours. 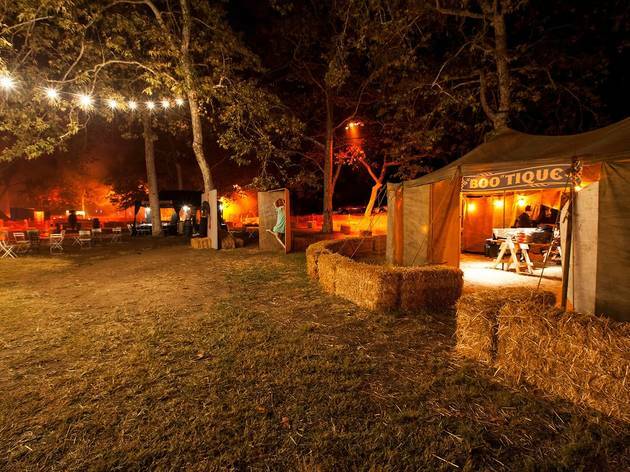 “We have two rules on where we meet—it’s got to serve alcohol and it’s got to be haunted,” he says. Ready to scare yourself silly? 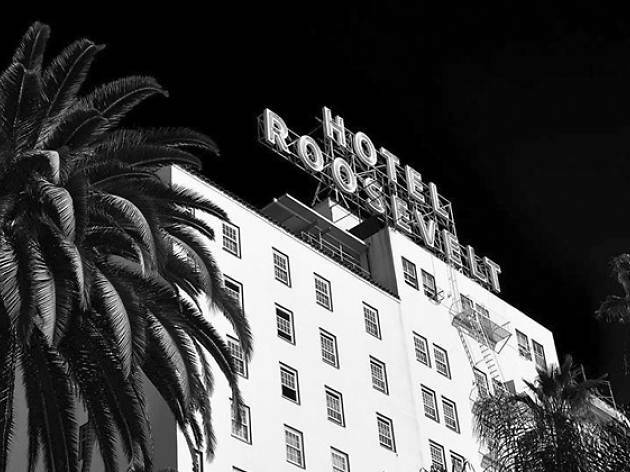 Here’s your handy guide to the 13 most haunted places in L.A., including a Hollywood theater, a notorious Downtown hotel and a Long Beach oceanliner where ghosts of the past still rattle a few chains. 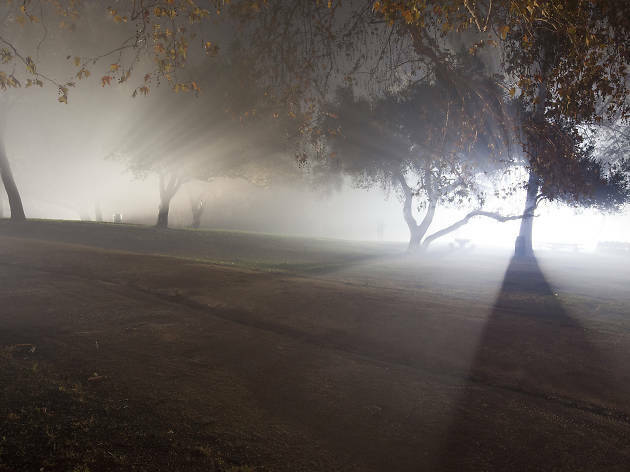 If you’re feeling brave, consider embarking on a haunted tour of Downtown L.A.
13 real haunted places in L.A. 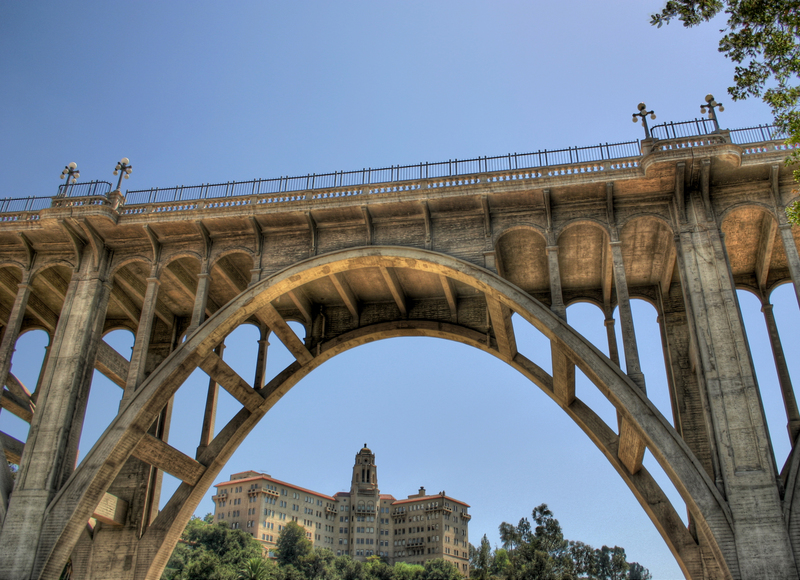 The haunting and hauntingly beautiful Colorado Street Bridge in Pasadena was completed in 1913, claimed its first suicide in 1919 and has sadly been the backdrop to a string of untimely deaths ever since. 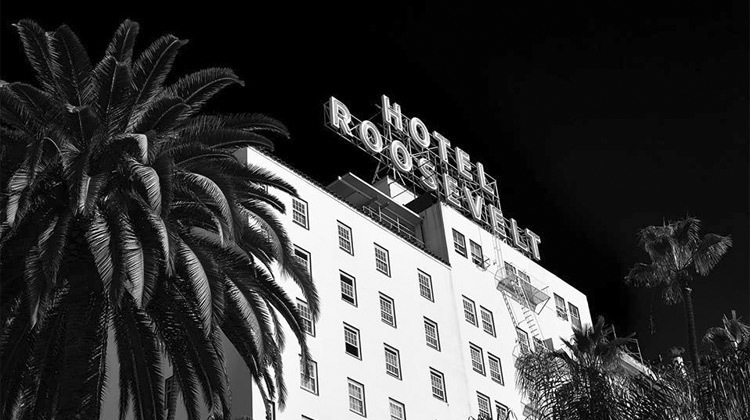 Legend has it that the ghost of Marilyn Monroe still haunts her old stomping grounds. “There was a famous mirror in the lobby where people would take pictures and claim they could see Marilyn’s reflection above them,” Carradine says of the full-length mirror that once hung in Monroe’s poolside suite, and then in the lobby where it has since been removed (kill-joys!). On the ninth floor, you can hear the late actor Montgomery Clift—who lived in suite 928 for three months while filming From Here to Eternity—practicing on his trumpet. “Guests have asked the hotel staff to tell the person in the next room to stop playing in the middle of the night," Carradine says. "But the room was actually vacant.” What’s more? Lights and faucets are known to turn on and off on their own and the switchboard gets calls from vacant rooms. 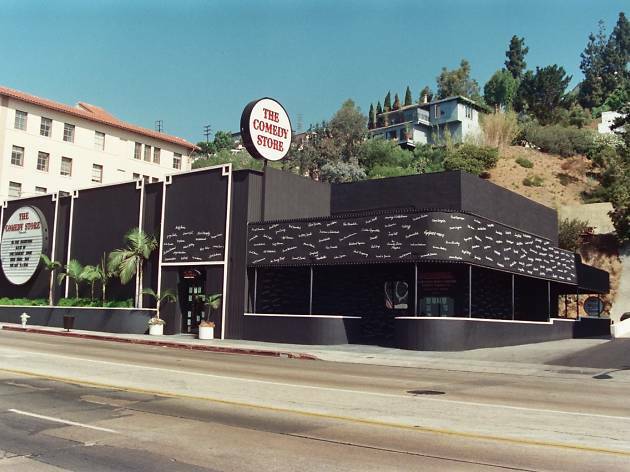 Before this popular Sunset Strip comedy club appeared on the scene in 1972, it was Ciro’s restaurant, one of Hollywood’s hippest clubs during the 1940s and ’50s. Its owners had a close affiliation with the mob and the building still has peepholes in the upper walls of the main room that once allowed mobsters to see who was coming and going. 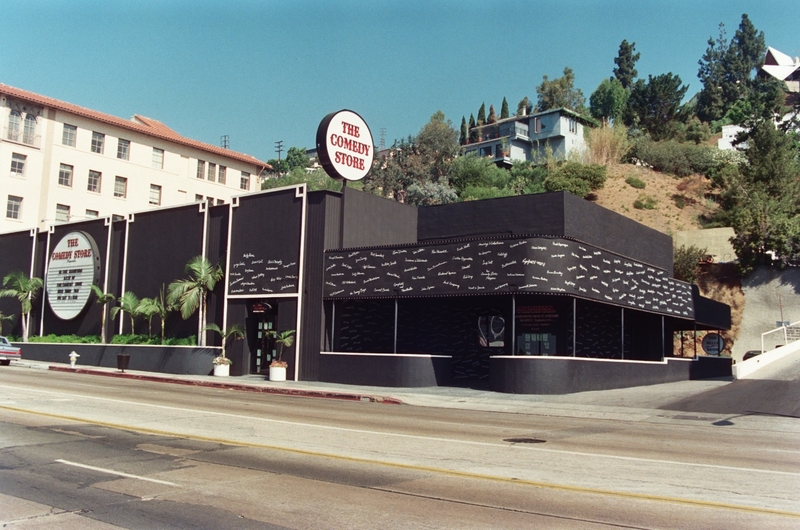 Mickey “The King of the Sunset Strip” Cohen used the club as his base of operations. “West Hollywood was a gangster-run place with gun fights in the streets,” says Carradine. “The basement of the club was where they would take care of problem people. There is still a hole in the stairway that fits a gun, to shoot anyone going up or downstairs.” Carradine says employees have claimed to hear voices, cries and even snarls coming from the basement. “After years of denying the ghost stories, the Comedy Store is now embracing its past and even started tours of the haunted basement,” he adds. 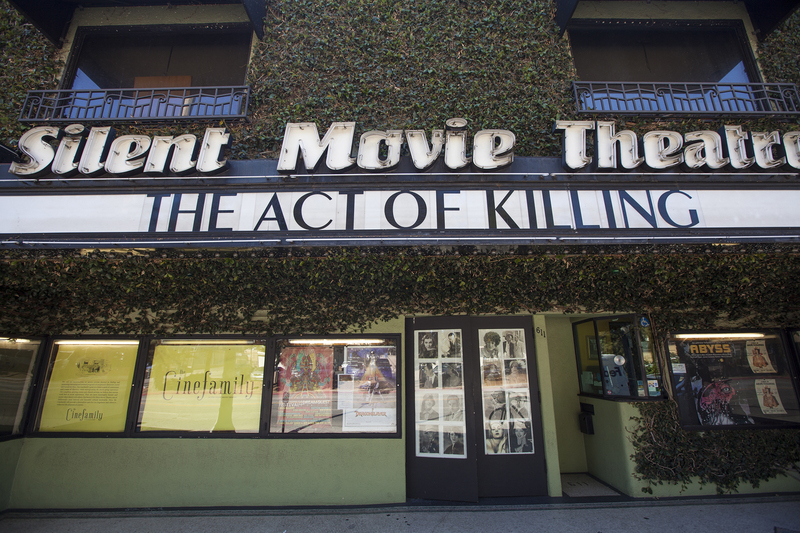 The Silent Movie Theatre (formerly home to Cinefamily) has a complicated history worthy of a blockbuster drama. 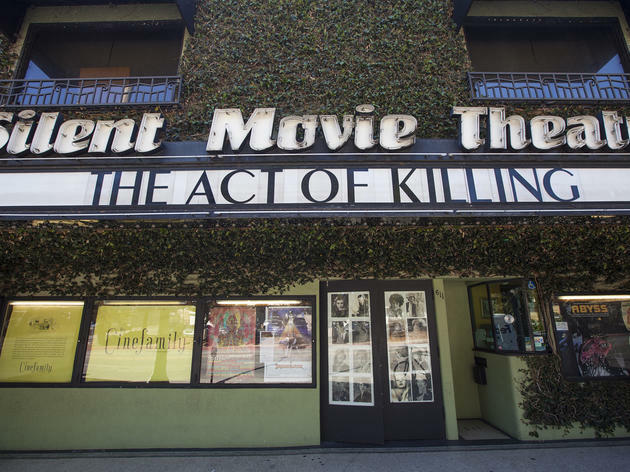 The original owner, John Hampton, started the theater in 1942, showing his personal film collection at a time when most studios were destroying old silent prints. Hampton used toxic chemicals in his bathtub above the theater to preserve his films—unwittingly exposing himself to toxins that hastened his demise in 1990 from cancer. Hampton’s mentee Lawrence Austin took over the theater. But one night in 1997, while visitors were watching a film, Austin was shot to death in the lobby by a hitman. The whole thing turned out to be a murder-for-hire conspiracy hatched by Austin’s lover and theater projectionist James Van Sickle, who later claimed that Austin signed the theater over to him in a hand-written will. Police weren’t buying it. Van Sickle and the hitman are currently serving life in jail. Austin’s ghost is said to still haunt the lobby; and Hampton’s ghost can be heard roaming the second floor, where he once lived. Photograph: Courtesy the Bruce Torrence Hollywood Photograph Collection and the Hollywood Sign Trust. Copyright © HollywoodPhotographs.com. All Rights Reserved. Back when it was the Hollywoodland sign, this icon to celluloid fantasy also served as a beacon to suicidal Angelenos—most notably Broadway stage actress Peg Entwistle. Trouble just seemed to follow Entwistle. Raised by her actor father, she lost both her mother and stepmother early in life and had a series of broken personal relationships. As an actress, Entwistle enjoyed critical reviews, and even shared the stage with Humphrey Bogart, but she was forever cast in the role of comedic ingénue and could only snag small film roles. 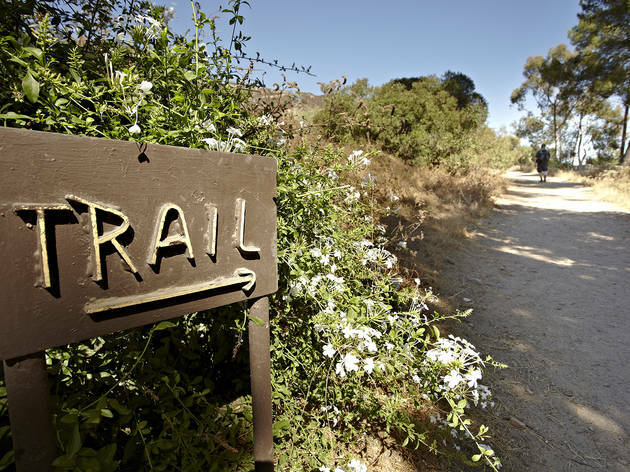 On September 18, 1932, a hiker found the blond, blue-eyed actress’ crumpled body in a ravine below the Hollywoodland sign. 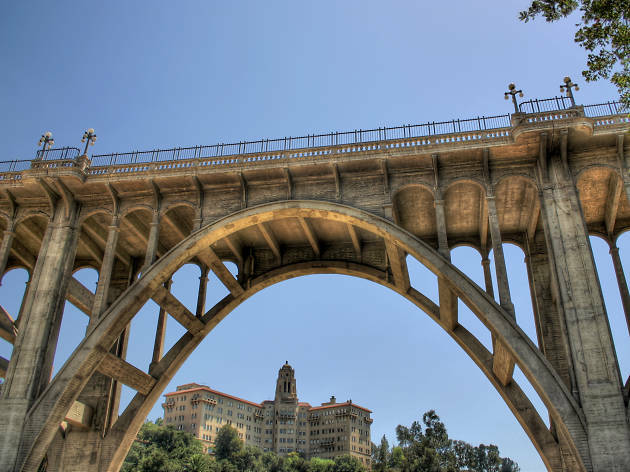 Police surmised that she climbed a workman’s ladder to the top of the 45-foot letter “H” and jumped to her death. 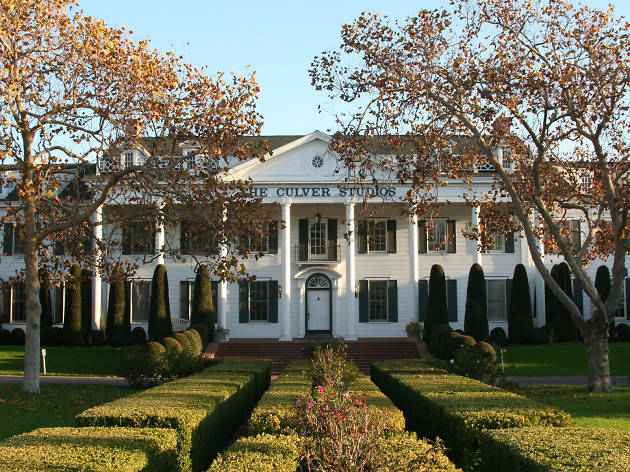 Visitors to the area say they still see the actress haunting the sign, and sometimes pick up the scent of her gardenia perfume. What, you don’t know about the sad tale of Doña Petrenilla? It’s a ghost story that’s been oft-told by writer Michael Imlay and the good folks at Creepy LA, but it bears seasonal repeating. In the late 1800s, wealthy land owner Don Antonio Feliz died suddenly from small pox. As legend has it, when his beloved 17-year-old niece Doña was cheated out of her uncle’s will, she put a nasty curse on the land and its owners. Since then, untimely deaths and ill omens have befallen the land’s deed holders, including Griffith J. Griffith, its last owner, who donated 3,105 acres to the city before going to prison for shooting and maiming his wife. 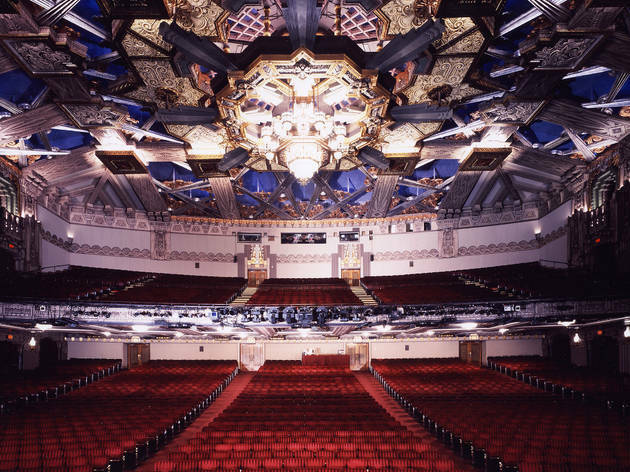 When charmed businessman Howard Hughes owned the infamous Pantages Theatre, he built a door that connected his office directly to one of the theater balconies, where he would go to think in the dark. Hughes’s ghost is a notorious workaholic, and is said to be seen in his former office on the second floor. “During the restoration in 2000, people said they saw a man stepping off the balcony, walking along the scaffolding, and standing over a worker to inspect his work. When the guy turned to ask the man what he wanted, the figure vanished,” says Carradine. Seems like Hughes is still looking after his theater. 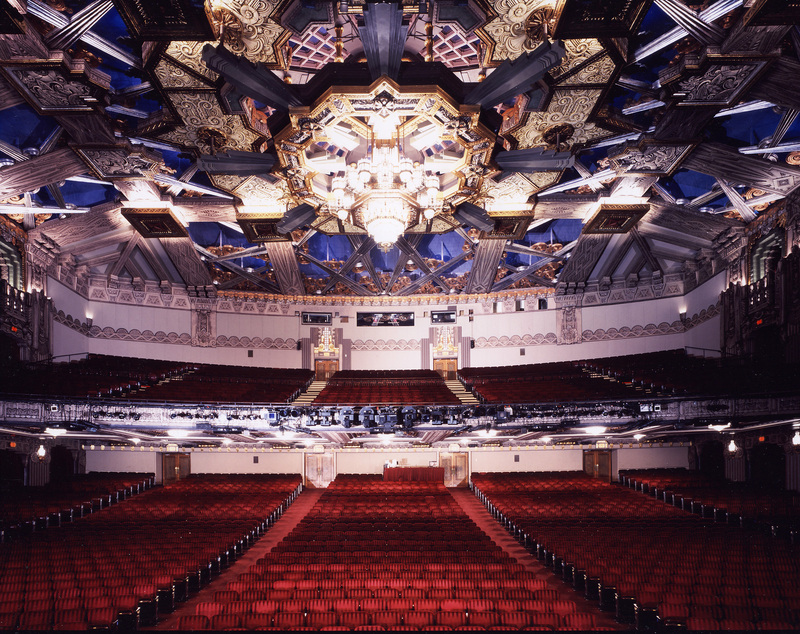 The Pantages is also host to a female presence who died during a show in 1932. “During a cast recording once, microphones were set up in the theater and they heard someone singing in the mic when no one was on stage.” Some say the woman who died was an aspiring singer who’s living out her unrealized dreams of performing at the Pantages. The studio complex where such legendary Tinseltown films as Gone with the Wind and Raging Bull were filmed was built in 1918 by silent movie pioneer Thomas Ince. Ince died in 1924, after falling ill on newspaper mogul William Randolph Hearst’s yacht during a star-studded cruise and dinner, celebrating Ince’s 42nd birthday. While the official cause of death was listed as heart failure, legend has it that Ince was actually shot and killed by a jealous Hearst, who was supposedly aiming at (and missed) Charlie Chaplin, who had eyes for Hearst’s mistress Marion Davies. Some say Ince’s ghost still shows up for work at his beloved former studio, and can be seen and heard walking through walls and criticizing management. This basement bar below the Townhouse restaurant in Venice was a true speakeasy during Prohibition. Back in the day, the speakeasy kept the hooch flowing via underground tunnels, which are now used as utility corridors. Some say former proprietor Frank Bennett, who owned the bar from 1972 until his passing in 2003, still haunts his favorite corner booth, across from the bar. “Venice was a real crazy place historically, in terms of alcohol and bars, especially during Prohibition,” Carradine says of the area. 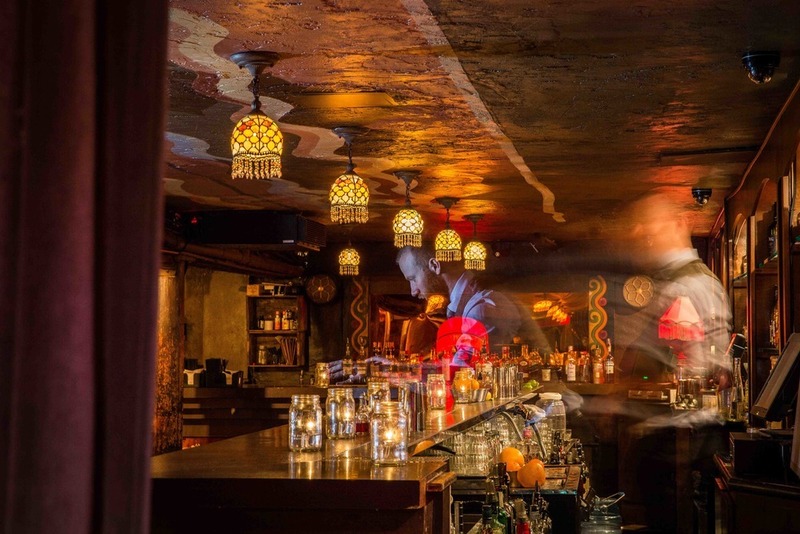 “This bar is a weird anomaly, it’s one of the oldest bars in L.A. with one of the newest ghosts,” he says about Bennett, who still watches over his beloved underground watering hole. 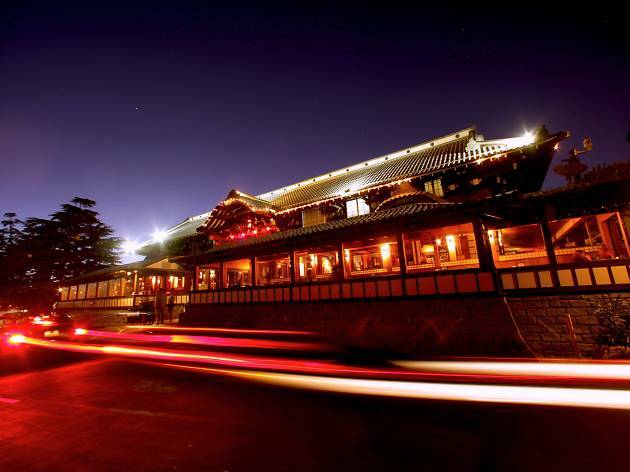 This gorgeous Japanese restaurant at the top of Sycamore Avenue in Hollywood features sweeping views of the L.A. cityscape—the perfect vantage point for resting souls. Pull up a barstool next to the phantom of a former bartender who has been spotted around the bar. The restaurant also serves as the perfect backdrop for events and weddings, if you don’t mind a little company in the bridal suite. “There have been sounds of a crying bride; and a woman in white has been seen up there,” Carradine says. Legend has it that the ashes of former property owner, Thomas O. Glover, are buried in the inner garden courtyard and that he still watches over his property. Rumors abound about silhouettes of a man and woman seen strolling the family-owned property and the unexplainable sounds of crashing plates (and you thought that was just a clumsy waiter). Sure, they milk the spook factor for all it’s worth every Halloween during Dark Harbor, but the Queen Mary in Long Beach is certifiably haunted according to the countless visitors who claim to hear voices and rattling chains during tours and overnight stays. 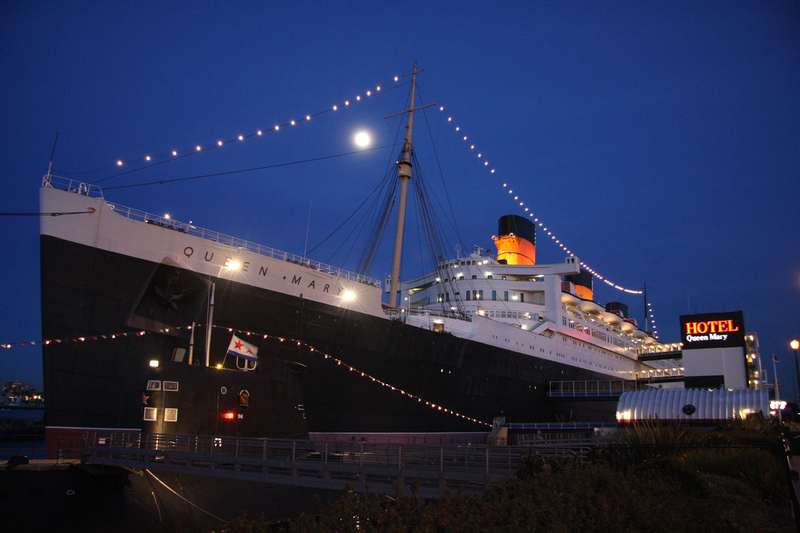 The Queen Mary certainly has a past that’s ripe for modern-day hauntings. She started life as a luxury liner, setting forth on her maiden voyage from Southampton, England, in 1937, and hosting everyone from Bob Hope to Winston Churchill. But when WWII began, the Queen Mary was drafted into service as a ferry ship, carrying thousands of troops into battle areas. The fancy lady was stripped of her chic facade, painted a camo grey and dubbed the “Grey Ghost.” After years of service in war, and at her majesty’s whim, the Queen Mary was eventually sold to a tour operator and sent to retirement in Long Beach, where she’s been a floating hotel and event spot since 1967. 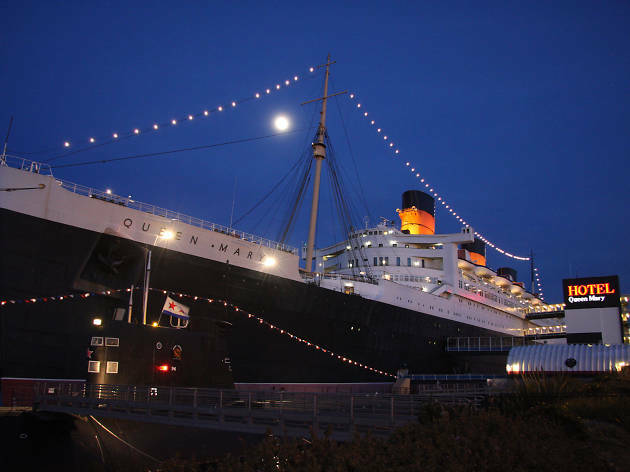 According to the late psychic and ghost hunter, Peter James, who led tours around the Queen Mary, almost all areas of the ship including the second class pool deck and engine room 13 are known to be haunted. 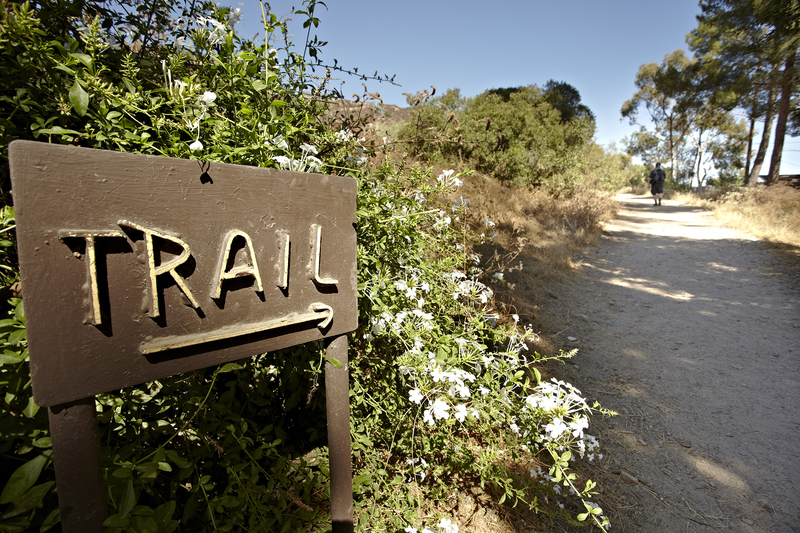 Avid hikers will recognize this spot as the Sam Merrill trailhead, “a quiet refuge from people and wild life forever”—so reads the dedication on the cobblestone gate of the Cobb Estate. But to ghost hunters, it’s the Haunted Forest. 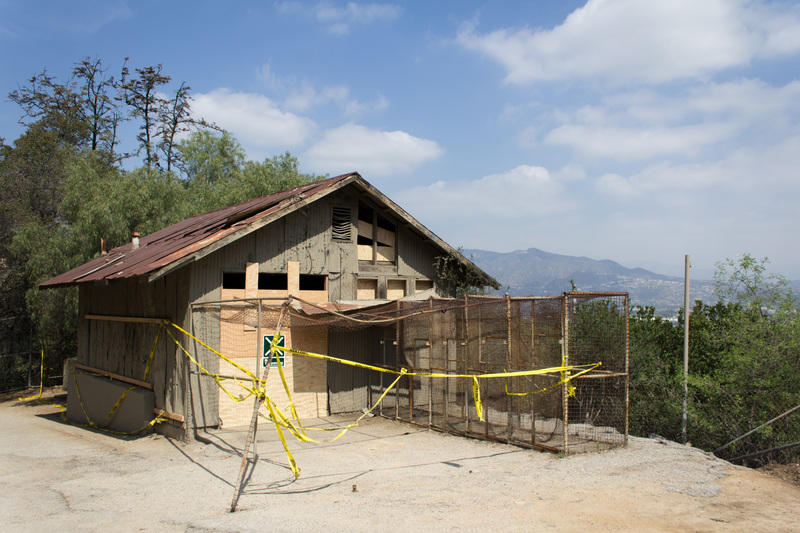 The sparse forest didn’t seem so haunted until the 1950s, when the Marx Brothers purchased the land and temporarily saved the dilapidated mansion from destruction—in the process turning it into a favorite haunt for squatters and ne’er-do-wells. Today, you’re more likely to find curious teens at night wandering around what’s left of the house’s foundation; though ghost sightings are non-specific, many report ghostly noises on the surviving staircase and the feeling that they’re being watched in the dimly lit forest. 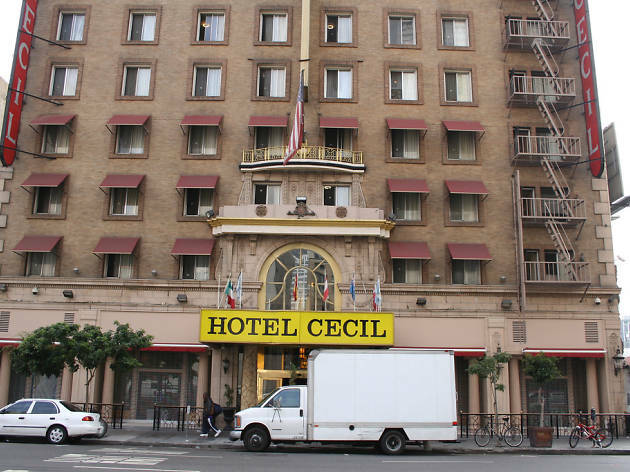 Though it’s had the odd ghost sighting or two, the Cecil Hotel’s history is haunted by real-life boogeymen. 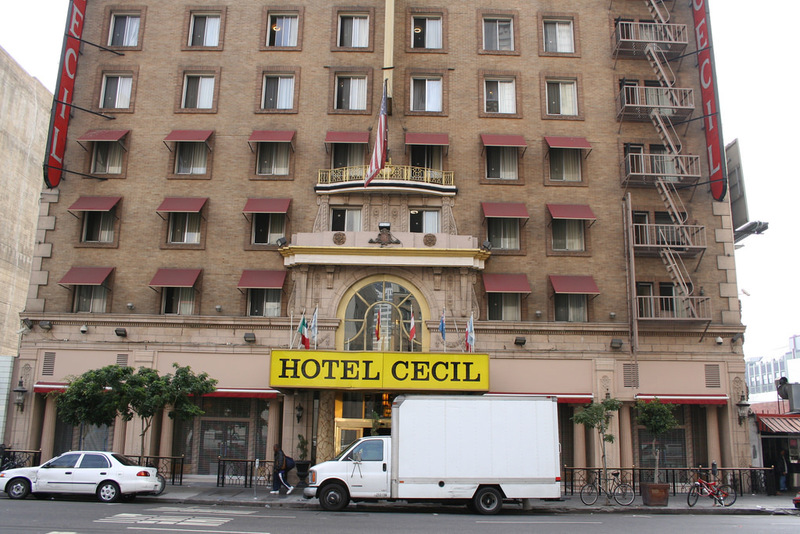 The hotel saw murders in the ’20s and ’30s, suicides out of upper-floor windows in the ’60s and the residence of serial killers Richard Ramirez (the Night Stalker) and Jack Unterweger. Most infamously, the naked body of tourist Elisa Lam was found in a rooftop water tank; surveillance video showed Lam acting oddly in the elevator. It was enough to inspire an entire season of American Horror Story, but apparently not enough to shut down the hotel; it’s now called Stay on Main and slated to be converted into a mix of rental units and hotel rooms. Looking for haunted houses instead? What’s Halloween without a few good scares? 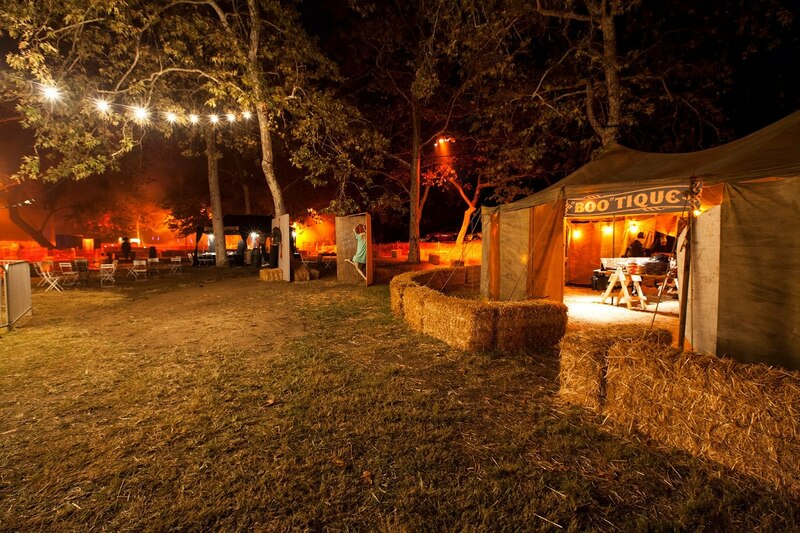 The best haunted houses in L.A. run the gamut from big-budget theme park productions to more homegrown horrors. Whatever thrills you, we’ve got it in our list of the city’s best haunted houses and attractions.